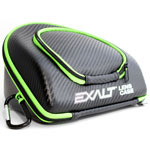 Designed specifically to protect your loader from the perils of the road, the Exalt Universal Loader Case stores your loader and other game-day essentials and guarantees their safe arrival. Designed to accommodate nearly every loader on the market, the Exalt Universal Loader Case can store your favorite hopper, up to 6 double A (AA) batteries, and even has an accessory pocket to accommodate an extra speedfeed, rain lid, or anything else you need to keep secure. Lightweight, tough water-resistant exterior, coupled with a supple high-pile microfiber lining makes sure your loader arrives to the field scot-free. Rigid, molded exterior prevents contents while inside your gearbag or at the field during handling. Great Product. Everything EXALT is the best!